Tim Hicks just announced for November at TD Place Arena - Spotlight Ottawa	:: Spotlight Ottawa - Your local music scene. Get out and experience it! TD Place has announced that Tim Hicks rolls into town on Thursday November 8th, 2018 with Tebey and Madeline Merlo! They take the stage at the Arena at TD Place. 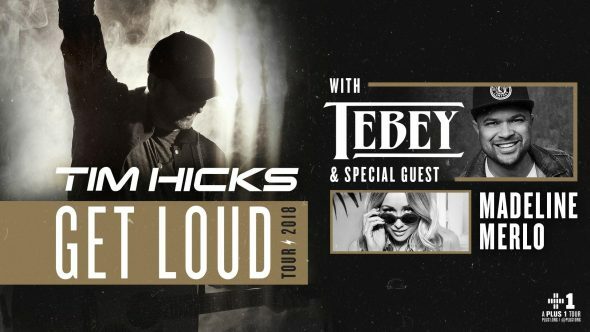 2018 Apple Music Fans’ Choice Award nominee and multi-platinum, award winning entertainer Tim Hicks announced today that he will turn up the heat this winter on his national headlining “Get Loud Tour” kicking off in Toronto, Ontario, on November 1st. Hicks along with special guests Tebey, Madeline Merlo (in the East), Andrew Hyatt (in the West), and Washboard Union (Toronto only), will take the energy-charged tour to 16+ cities across the country with additional dates in Nova Scotia and New Brunswick to be announced soon. Located in the heart of the city, the arena and stadium at TD Place form the centerpiece of Ottawa/Gatineau’s newest urban lifestyle district, Lansdowne. The stadium seats 24,000 for live sports and 30,000 for concerts. The arena seats up to 10,000 for live sports and can be configured forintimatetheatre style concerts for between 2,000 and 7,000 fans. Ottawa’s exciting downtown sports and entertainment destination is surrounded by restaurants, shops, services and excitement. For more information and events listings visit the TD Place website and follow TD Place on Twitter @TD_Place and Instagram @TDPlace.